Electronic Arts hasn’t made a whole lot of friends over the years as one of the video game industry’s juggernaut publishers. This has been magnified in recent years as the evolution into downloadable content and the ever-growing control developers and publishers have over their titles after they’ve been released and make their way into your homes has allowed EA do things their way, a way that draws a very distinct line in the sand and declares one thing quite loudly: money over all else. Thanks to this “We can honestly say that we just simply don’t give a damn, and we’ll say it right to your adorably enraged faces” approach to the business, a new title has been bestowed upon the company. That title: The Worst Company In America, 2012. 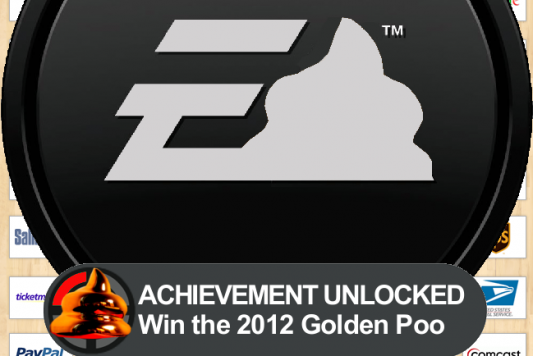 And with it, the not-so-esteemed Golden Poo trophy. “We’re sure that bank presidents, oil, tobacco and weapons companies are all relieved they weren’t on the list this year. But while guns can kill you and cigarettes can kill you, people know what they’re buying and get what they pay for. EA, on the other hand, has developed a nasty reputation for their greedy tactics, charging extra for as much as they feel they can get away with and leading to a mass of customers who feel like they’ve been robbed that grows larger and larger every day. One of the things that has folks labeling EA as just a tiny bit tyrannical has been a war against places like retailer GameStop, who makes big money by buying and re-selling used video games. The ongoing battle has begun affecting consumers as EA has now started taking drastic measures by requiring those who want to enjoy certain aspects of their games, such as the multiplayer option on titles like Battlefield 3 and Mass Effect 3, to enter in a special code. For anyone who buys the games used, the code will usually be cashed in and useless, and you will not be able to take part in all the game has to offer. So what can be done to stop Electronic Arts from continuing their despicable ways? Well…nothing, really. The sad and depressing fact is that we buy EA games, we buy lots of them, and they know it. They dominate the world of sports video games and they’re behind some of the biggest franchises out there, so, despite the sickening ways they go about things, they haven’t gone so far as to force consumers to take a stand against them…yet. One day it’s going to go too far, however, and their world could come crashing down. Whatever corporate catfight they want to have with companies like GameStop is one thing, but keep taking away people’s right to freely choose when, where, and how they buy and play their games (not to mention how much they have to spend to enjoy the full experience), and they’ll eventually bite back. What do you think about EA’s new award? Well-deserved, or should another company have been named worst in the country?